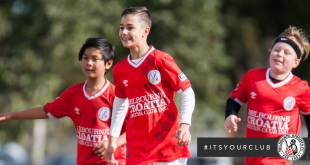 A first half that nightmares are made of set up a thumping 6-1 Heidelberg win over a shell-shocked Melbourne Knights at the Olympic Village on Sunday. Only the brave read on. The home side entered the game fresh of their own 6-0 loss against South Melbourne, and were missing regulars Andreas Govas, Kane Sheppard, Shaun Ellis and suspended keeper Theodoridis. However if Knights thought that they were in for a stroll in the park, they were in for a rude awakening. Just four minutes in, Kosta Kanakaris found himself completely unmarked at the back post to slot home the opener. A failed clearance just four minutes later fell invitingly to Petrie at the edge of the box, and his dipping shot eluding O’Farrell in goals. Blink and you missed it, as the Bergers’ went 3-0 up in the 12th minute. Rueben Way cut in from the right wing and drew a good save from O’Farrell only for Noon to tap home the rebound from close range. The Knights almost got one back immediately as Jason Hicks’ free kick was expertly saved by Clark, before the resulting corner saw Andrijasevic’s header cleared off the line. However, just two minutes later and the home side effectively killed off the contest with Kanakaris slotting home his second goal of the half to give his side a 4-0 lead just 16 minutes into the contest. Hicks was the player most likely to make things happen for the visitors as he drew another good save from Clark, but just on the half time whistle Heidelberg rubbed salt into the wound. Reuben Way capitalised on a defensive mistake to find himself clean through on goal and made no mistake. The second half didn’t start well for the Knights’ either as Athiu made it 6-0 early on, heading home unchallenged following another defensive mistake. Shortly after Kanakaris had the perfect opportunity to complete his hat-trick as he found himself with only the keeper to beat, but opted to round O’Farrell allowing the custodian to recover in time. Despite the score line, the Knights continued to play attacking football and enjoyed their best spell of the game in the last half hour. Ivan Grgic header from close range drew a spectacular save from Clark. 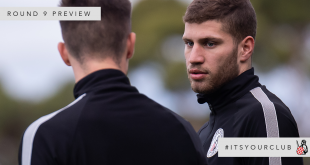 The Knights deserved a consolation goal for their late play, and got one from Jacob Colosimo in the 74th minute who made it two goals in two games by chipping the keeper. Redemption is on the cards for the Knights who face Northcote City on Friday night at Knights Stadium. In the Under 21’. Heidelberg United defeated the Knights 1-0. 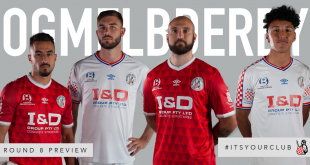 Melbourne Knights Squad: 1.O’Farrell, 3.Grgic, 5.Batur, 6.Cali, 8.McGarry (14.Mikulic 68’), 9.Colosimo, 10.Jurkovic (4.Surey 25’), 16.Hicks, 17.Purcell (18.Brekalo 46’), 19.Glavan, 21.Andrijasevic. Cautions:. 3.Grgic, 21.Andrijasevic, 9.Colosimo, 5.Batur. Heidelberg United Squad: 1.Clark, 3.Doumbalis, 6.Hall, 7.Way (5.Miltadou 86’), 10.Petrie, 11.Kanakaris(24.Tsakiris 70’), 12.Athiu, 13.Byles, 14.Noon (8.Cartanos 46’), 15.Ilic, 17.Pace. Cautions. 14.Noon, 11.Kanakaris, 7.Way, 10.Petrie. Goals: Kanakaris 4’, 17’, Petrie 8’, 45’, Noon 12’, Athiu 54’.